Giraffatitan was a massive plant-eating dinosaur that lived in Africa during the late Jurassic period and perhaps into the early Cretaceous period, between about 154 and 142 million years ago. It was closely related to Brachiosaurus (which lived in North America), and indeed some scientists argue that it should be classified as a type of It was closely related to Brachiosaurus. Like Brachiosaurus, Giraffatitan was very large and heavy. It grew to perhaps 75 feet (22.9 meters) long, and weighed around 89 tons. Also like Brachiosaurus, Giraffatitan's front limbs were long than its hind limbs, and this feature, together with its long neck, allowed it to browse the foliage at the tops of tall trees. African Dinosaurs - Giraffatitan lived in Africa. Giraffatitan was a genus of dinosaur. Some scientists have argued that Giraffatitan should be classified as a species of Brachiosaurus. Giraffatitan was a member of the Saurischia ("lizard-hipped") order of dinosaurs. What this means, is that although Giraffatitan was not closely related to lizards, it did have similarly shaped pelvic bones. Giraffatitan was a Sauropod - a member of a group of related large quadrupedal herbivorous (plant-eating) dinosaur with long necks. Giraffatitan lived between about 154 million years ago and 142 million years ago, during the late Jurassic and early Cretaceous periods. Giraffatitan was a herbivore (plant-eater). Giraffatitan was about 75 feet (22.9 meters) long. Giraffatitan weighed about 89 tons. Excavate! Dinosaurs is the perfect paper paleontology collection for dinosaur-loving kids ages 7 and up. With fun text and colorful illustrations, Jonathan Tennant explains the anatomy, habits, and diet of 12 iconic dinosaurs from the Cretaceous, Jurassic, and Triassic eras. Pages of pop-out pieces can be assembled into stand-up paper models of each dinosaur skeleton, but only if kids can use their new knowledge and imagination to put the pieces together correctly — just like real paleontologists do! 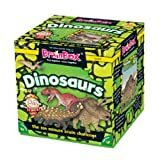 For young dinosaur-lovers everywhere, this exciting Brainbox, developed specifically with younger children in mind, introduces a world of prehistoric creatures, from favourites such as Tyrannosaurus and Triceratops to less familiar dinosaurs such as Giraffatitan and Zalmoxes.